Transposed out of the Cana setting in which these words come to us, they apply to every instance of human feasting and so also become a pertinent Thanksgiving reflection. On the surface, having no wine seems like a statement of ordinary reality, albeit a sad one. How can there be a feast without wine? On closer reading, however, the matter of fact declaration ‘They have no wine’ reveals more than the obvious. The mother of Jesus says very little. Where is the request? It seems lost in a hidden maternal trust which further conceals a thanksgiving; the two dispositions of her soul manifest in those simple words encompass a petition, an act of confidence, and a silent gratitude. They are the perfect prayer, emanating from her maternal heart. These simple words usher the first public manifestation of the glory of God. So much power lies ensconced in the hiddenness of her soul — there where communion first takes place and the feasting never ends. For she knew He could act, would act on behalf of the children, and for their good. 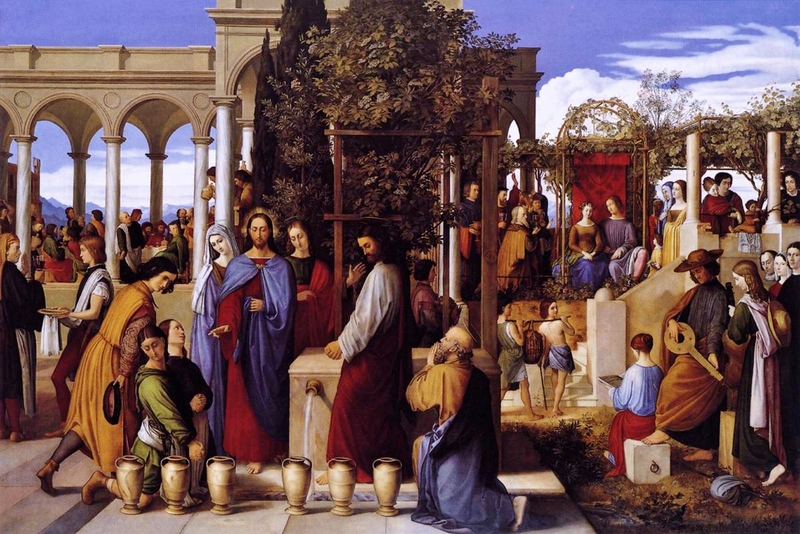 And not only the two whose wedding feast they attended, but the many who would follow at the banquet where the water always turns to wine: that of the eternal Eucharistic feast. And it is so that she waits. She waits for that fulfillment of the promise that had been given her and was revealed true years before. The faithfulness of God continues to be the anchor of her faith. The surety of her maternal confidence enables the perfect request, one that is sensitive enough not to be blunt and yet bold enough to be clear. She waits, having uttered a silent whisper by the table feast. She knows the children need. They simply need. Yes, it is wine they lack, and yet, with it, much more. They need Him. They need that wellspring of grace she carried in her womb; her Son who now stands at a distance among friends. There is a union in this separation, and it is unique in the history of salvation. She, the mother, knows herself to be His Mother, and learns that she is to become their mother through Him. The extension of her maternity is cruciform: one hand calling Him, another, redirecting his gaze as only a mother can — pointing to them. Her maternal union with God is an image of what every maternity should be: a cruciform and generous care giving that shares the great responsibility of bringing others to God, while delighting in the joy of this joining of loves. If every human feast were like Cana, we would know the ceaseless hidden joy of the heart of this Mother, whose trust and confidence were enough to move the heart of God to reveal Himself the guest of men. The wellspring of maternal love is transformative — a force that generates not simply physical life, but spiritual life as well. Each mother has the capacity to participate in the confident humility of the Mother whose simple words ‘They have no wine’ bespeak an interior strength of hope and encapsulate a lifetime of trust. The Mother’s life story is a waiting feast. She waits in prayer. She is found waiting on the angel’s visit. She waits for room in the inn and brings the Son of God to men in a stable. She waits as she looses her son among the crowds only to find Him in the temple. She waits at Cana. She waits on the way to the cross — that walk of hope and agony — and then catches a glimpse of Him as He falls. She waits on Calvary. She waits for Him to die and is the first to wait for Him to rise. Waiting in joy, waiting in sorrow, in trust and hope, while the heart is rent or at peace — in all her waiting her maternity remains hidden. The feast is within. She knows a mysterious joy every mother knows, often veiled in tears. It is a joy that is rooted in a love no one can take away, and it is resounding in its hidden silence. For all the feasts that take place, feasts of love and marriage, feasts of physical and spiritual birth, feast of sacrifice and vowed offering, feasts of rejoicing in the finding of what is lost, feasts of thanksgiving, feasts of the heart in the hope that life will live yet even in death; for every feast laden table, there is a mother who waits. Such delicate concern, such hope, such faith in providence that abounds apart from human miscalculation and betrayal and failing short — a providence that is greater than sin and greater than doubt, greater than death and loss, greater than division and scorn, greater than jealousy and envy and derision; greater than all we are greatly lacking. She is firm. She exudes a strength of trust — a maternal trust that acts physically and rejoices spiritually. She feasts in the depths of the abundance of God, her God, for He is also her son — He who makes plain waters crimson at the feast. He who is the feast. And it is so, perhaps, that Thanksgiving is also a maternal feast of thanks; participation in the one feast of love that first made Cana a kind cenacle, and makes each home an ever modern one. For the incarnation continues as the hidden thanksgiving resounds. And the feast follows. Lives, hidden yet real join in the wonderful abundance, seen as she saw her son in the distance of that banquet, where as the feast rolls on, untold miracles happen. The best wine surprises at long last; torrent of grace and sweet delight for souls gathered there. The Mother waits for the children she loves to carry forth in hope. These will be her final recorded words. Blessed be the name of the LORD from this time forth and for evermore! From the rising of the sun to its setting the name of the LORD is to be praised! He gives the barren woman a home, making her the joyous mother of children. Here, now, the Lord has visited his people. She has given all. And received All. Offered in memory of our daughter, Maria Caterina, for whom we are ever grateful to God. May she join in the thanksgiving of the saints — that endless feast of holy souls. This is the fifth article in a series on maternity. See also The Hidden Face of Love, The Common Good of Hidden Maternity, Why I Choose Not to Buy Myself A Child, Procreation is Not For Us.